The Hall County Sheriff’s Office, Hall County Animal Shelter, Hall County Fire Services, Hall County Juvenile Court and Hall County Parks and Leisure Services are all partnering with Hall County Family Connection Network for the Teen Maze event at East Hall Community Center. 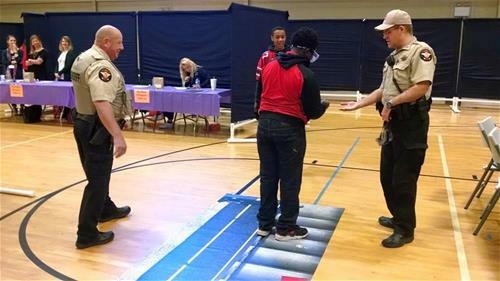 The Teen Maze allows students to experience a simulated party, motor vehicle accident and emergency room scene. Topics addressed during the event include healthy relationships, substance abuse, abstinence from risk-taking behaviors, sexually transmitted diseases, consequences of teen pregnancy, parenting, financial responsibilities, death and legal consequences. Eighth-grade students from Gainesville Middle School participated in the event on Thursday while eighth graders from South Hall Middle School were scheduled to participate on Friday. “We are proud to partner with Hall County Family Connection Network on this initiative as it gives us another opportunity to build a strong relationship between young people and law enforcement,” said Hall County Sheriff’s Deputy Chad Mann. Fielding said a total of 585 students were served during the two-day event.